Polish cabalist and Shabbethaian preacher; died at Amsterdam shortly after 1690, or, according to another account, in Poland in 1682. Owing to Nehemiah's wide knowledge of the Cabala he was sent by the Polish communities in 1666 to the Turkish city of Gallipoli, where Shabbethai Ẓebi was at that time detained, in order that the latter's claim to being the Messiah might be investigated. Shabbethai Ẓebi was at first pleased with the arrival of Nehemiah; but after a long discussion Nehemiah frankly declared him to be nothing else than an impostor. Shabbethai and his followers thereupon decided secretly to kill Nehemiah, but the latter detected their design, and ran into the street, shouting that he wished to embrace Islam. Immediately the turban was placed on his head and he was declared to be a Moslem. To the Jews Nehemiah stated that his conversion was only temporary, in order to enable him to expose the pseudo-Messiah to the sultan. He was indeed sent by the governor to Adrianople and received by the sultan, who rewarded him for his acceptance of Islam; and, as a result of the information given by him concerning Shabbethai, the latter was brought under guard to the same city. When later Nehemiah returned to his native country he declared himself to be a fervent adherent of Ẓebi, relating wonders performed by the latter as the Messiah. Moreover, he pretended to be himself "Mashiaḥ ben Yosef" (the Messiah, the descendant of Joseph), the precursor of the great Messiah, the descendant of David. In consequence the Polish communities excommunicated him. Nehemiah then went to Germany, where he changed his mode of dress and used the name of Jacob. He was, however, recognized by his countrymen, and left the place. He then wandered from town to town till 1690, when he arrived at Amsterdam, old, half blind, and covered with rags; here also, despite the name Jacob, he was recognized. According to another account, he became again a very pious Jew, on his return to Poland passing his time in fasting; and even before going to the East he was regarded as a holy man and styled "the prophet." 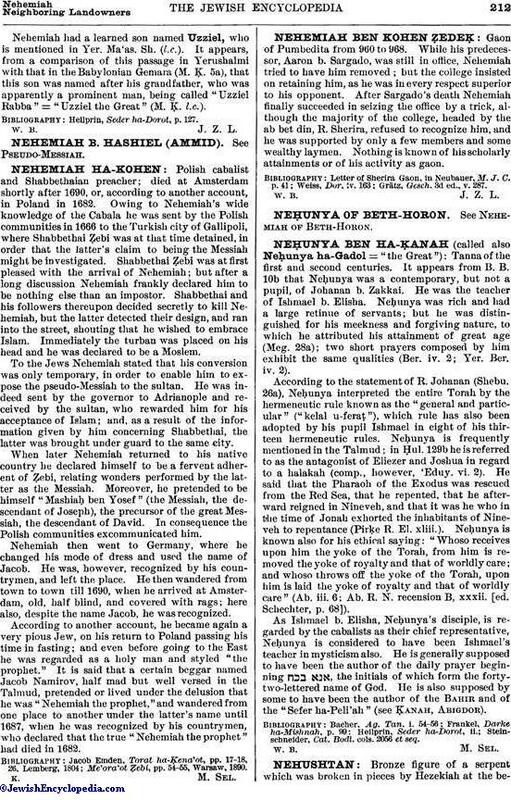 It is said that a certain beggar named Jacob Namirov, half mad but well versed in the Talmud, pretended or lived under the delusion that he was "Nehemiah the prophet," and wandered from one place to another under the latter's name until 1687, when he was recognized by his countrymen, who declared that the true "Nehemiah the prophet" had died in 1682. Me'ora'ot Ẓebi, pp. 54-55, Warsaw, 1890.